Taco Bell Cantina on the Vegas Strip offers a tapas-style menu, beer, wine and frozen alcohol-infused drinks. : Open 24 hours a day, this two-story booze-serving flagship restaurant features an open kitchen and tapas-style appetizers such as quesadillas and chicken fingers in addition to the regular Taco Bell menu. 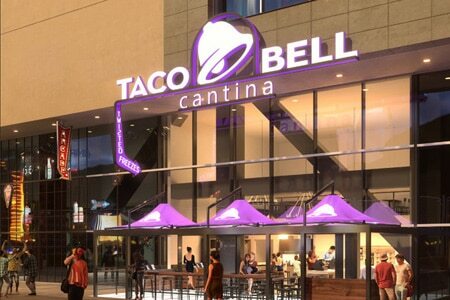 Expect an outdoor patio, a retail shop selling Taco Bell merchandise and memorabilia, an occasional DJ and a Freeze Wall with eight different flavors (margarita, cola, pina colada, lemonade, orange, baja blast, cherry and blue raspberry) that can be customized with gin, vodka, rum, tequila and whiskey.